It becomes extremely crucial to spread salt over your walkways and driveways during the winter months to prevent further build-up of ice. However, manual salting might not be equally efficient and even lead to the formation of clumps which ultimately reduces its effectiveness. This is where a walk behind salt spreader comes in to clear all the snow by ensuring even salt spread all over your desired region. The salt spreader looks more like a wheelbarrow and comprises of an underneath hopper which ensures even distribution of salt while moving along. However, it is imperative to develop a clear understanding about its different types before taking the ultimate buying decision. Today we are going to take you through five of the best salt spreaders but first we are going to discuss about the most important salt spreader types from which you can choose the one which shall serve you best. The best snow throw cannot guarantee you a dry and ice-proof pavement during winter months. Snow has a tendency of running back to your pavement in liquid form after melting. This in turn will present you with greater challenges as the temperature drops further. Usage of salt has thus been advocated as the best solution to get out of this scenario. They have been designed for being attached to the back of a multi-terrain vehicle. It thus becomes easy to spread fertilizers, ice melts and even salt after attaching the salt spreader to the back. This can serve as your ideal pick if you wish to save both time as well as fuel. A spot spreader can be attached with a walk behind snow blower for melting away the remnants post blowing. However, it is advisable to check the same before placing your order since they are not compatible with all the models. You can choose this option if you need to spread salt over a considerable pavement area. It is thus designed to take on big jobs by being attached with the hitch present at the back of the truck. On being equipped with durable augers, they can spread salt with greater efficiency. This highly common spreader type consists of two large tires as well as a spreader plate which uses a set of gears for turning the axle. As you chug along, salt pours over the rotating spreader plate to prevent the formation of ice on the driveway or pavement. You can benefit out of this salt spreader if you own a lawn or garden tractor. You can easily cater to a bigger area using the tow-behind spreaders as the tractor cleans away snow. Whether you are spreading fertilizer, salt or seed, the broadcast spreader from Scotts can keep you covered at all times like an absolute pro. This pre-calibrated spreader features a large hopper which can hold up to 15000 sq. ft. of lawn care products for being used ahead. Its hand-held broadcast can easily cater to areas within 5000 sq. ft. without facing any difficulty. The control panel settings of this versatile spreader pave the path for accurate coverage and uniform spreading over your lawn. You can thus prevent the spread of seed or salt to non-lawn areas for greater precision coupled with its EdgeGuard technology which blocks off the right side of the spreader on being engaged. Offers the flexibility of choosing the amount of layer you wish to put down. Side blocker can be switched to both the sides for controlling it from spreading out on the sides. The handle can be folded for easy storage. Spinning mechanism works pretty well while using hardened pieces of fertilizers. Precision rate settings of the control panel usher in more accurate coverage. Features the exclusive EdgeGuard Technology of Scotts. Trap door gets struck at times. Does not work with manure. 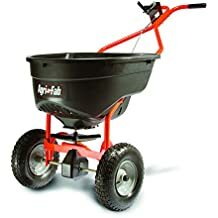 You can now finish your salt spreading tasks much quickly coupled with the 130 pounds broadcast spreader from the house of Agri-Fab which is the perfect appliance for spreading grass seed as well as fertilizer all across your lawn. Its ergonomic design ensures that you do not get tired in spite of working over long spans of time. The inclusion of large pneumatic tires make working with both long grass as well as snow over 25000 sq. ft. a hassle-free affair. This versatile device can also keep your back while spreading salt over your lawn during the winter months for prohibiting further accumulation of ice. Lawn care is bound to seem like an extremely fun experience with this easy to control spreader. Two other features which adds to its lucrativeness are a solid rod gate control and rustproof poly hopper which also accentuates its longevity. The lifespan of the spreader gets further increased with its aluminium bevelled gear whereas the enclosed gearbox makes it possible to use this spreader throughout the year. Can carry more than 100 pounds of weight. Works seamlessly with pelletized lime. The hopper empties on its own with only a small amount left at the bottom. Settings are labelled on the control to provide you with adequate guidance. Ergonomic handle height makes it comfortable to use. Bolts are not manufactured with stainless steel thus making it prone to rust and creating requirement for frequent replacement. There is no means of controlling the side of the spreader where the seed or fertilizer gets broadcasted. Cover of the hopper has to be purchased separately. The Lesco 092807 Push Spreader can guarantee a smooth spreading operation with its ground-breaking dynamics which have already made it a top pick of people around the globe. Lesco has already earned the tag of being the “the Rolls-Royce of broadcast spreaders” and by looking it its product specifications, it is not very difficult to gauge out why. 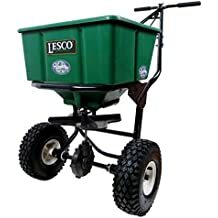 You can trust the Lesco 092807 walk-behind Push Spreader having a frame manufactured out of powder-coated steel carbon to withstand various weather conditions with excellent durability. Irrespective of being used rigorously in rugged outdoor environment, this versatile model can serve you longer than its peers. Its 50-pound hopper is ideal for spreading fertilizer, seeds, ice melt, salt and similar granular materials in an effective fashion. The double tires of the Lesco 092807 can take on various types of terrain and exercise easy control over the same. Be it medium or small lawns, the Lesco model can serve as your ideal bet as it comes with full assembly to assist you in starting work almost immediately. 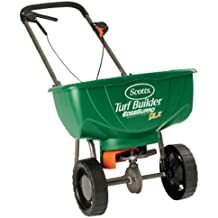 Its lightweight and compact design ensures that you do not face any difficulty while pushing this spreader over your entire lawn. The enclosed gearbox imparts adequate protection to the gear system from debris and dust for ensuring its longevity. Assists in delivering a steady amount of fertilizer. Well balanced spreader which runs pretty smoothly. Heavy duty machine offering optimum value for price paid. Makes it extremely easy to push ahead. Can hold a huge bag without facing any difficulty. Hopper cover has to be purchased separately. You can now tackle even the worst of winters coupled with the 130-pound Push Broadcast Spreader by Agri-Fab. This easy to use salt spreader can tag along increased convenience as well as efficiency with its state-of-art dynamics. The enclosed gear boxes of the salt spreader can render adequate protection against snow, ice and similar elements which are necessary to ensure its seamless operation. Its large pneumatic tires pave the path for easy maneuverability while the professional alloy bevelled gear assists with increased durability. The aggressive treads on its 13 inch tires assist in confidently navigating on uneven or icy driveways and sidewalks. The clever inclusion of a deflector makes it tailor-made for sidewalks by narrowing down the spread pattern to 24 inches. You can thus adjust the spread in accordance with your requirements and keep salt from spreading into sensitive vegetation. The super durable hopper cover can easily resist rusting, dents as well as other forms of wear and tear. It also gets easy to keep moisture out and render adequate protection to unused salt in between uses coupled with the accompanying rain cover. Dry material as we all know is essential to ensure an even spread which in turn paves the path for increased efficiency. Features large pneumatic tires having steel wheels. Comes with a limited consumer warranty of 3 years. You can bid adieu to the hassles of cables through solid rod on/off connection with the flow gate. Features commercial-type gearbox having aluminium gears. Does not throw material back at the operator. Lightweight model which is extremely easy to handle. Lacks stainless steel parts making it imperative to clean and lubricate the salt spreader periodically. 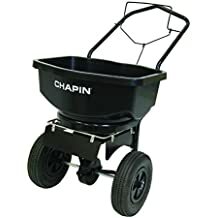 If you are on the lookout for a device which can assist you with the spreading of fertilizers, seeds, salt as well as ice melt and halite, then the Chapin International model can serve as your ideal pick. Its high-quality construction makes it resistant to rusting and corrosion and thus perfect for everyday use. 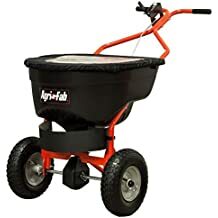 Coupled with a capacity of 80 pounds, this salt spreader for home use comes coated with a powder steel frame which imparts greater durability and ergonomics to this model. It also assists in bidding adieu to flat tires as the clever inclusion of 12-inch pneumatic ones make it easy to work on a plethora of terrains with increased ease and stability. The brand-new spike auger effectively whisks salt for minimizing clumping by agitating the same. You can also expect the Chaplin International slat spreader to serve you longer with its enclosed gear system which has been specially designed to withstand various elements. You can operate it as a fertilizer, salt spreader and seed disperser while handling more materials in comparison to a granular with its simple gate adjustment. The spreader features both side and front Baffle system which imparts directional control while spreading over sidewalks and driveways. Its bail system has been designed ergonomically for assisting users with manoeuvring this versatile equipment with both their hands. Enclosed gear system of the 80-pound capacity hopper helps in withstanding elements. Adequate support rendered by the rugged powder coated steel frame. Directional control can be exercised over spread pattern on driveways and sidewalks through side and front baffle system. Detachable handle makes spreading an extremely easy affair. Increased stability guaranteed by its 12-inch fully pneumatic tires. Accompanied with a grate and snow/rain cover. Does not work well with sand. Shovels and rakes serve as our go-to option when we deal with the job of snow removal. However, they cannot completely guarantee a snow-free surrounding. This is why people resort to the application of salt as one of the most convenient ways of melting snow. Apart from eliminating ice, salt also hinders the snow accumulation process even when the mercury dips further. Walk behind salt spreaders as we all know are a highly effective way of applying salt as it ensures an even spread with minimal effort. It can also render adequate protection to your hands from snow, making it the ideal choice for spreading seeds and fertilizer in your lawn throughout the year. However, with a plethora of salt spreaders available in the market it can be difficult to take the final purchase decision. This is where we come in with expert recommendations and in-depth analysis of various products to advise you regarding the best available ones.